In solidarity with hundreds of millions of people around the world for an action on climate change, the UAE residents from every walk of life, in communities large and small, will symbolically dim lights in their residential premises on Saturday evening. The observation of Earth Hour from 8.30pm to 9.30pm is the contemplation of the one thing we all have in common -- our planet. So stand up, to take responsibility, to get involved and lead the way towards a sustainable future, turning off all lights along with over 1 billion people in 1,000 cities around the world. With the confirmed participation of citizens from 118 countries and regions, the Earth Hour is anticipated to be the greatest civil action the world has ever witnessed, a global team hundreds of millions strong that will show the world what can be done. The UAE environmental activists have been campaigning for a couple of months urging the residents to pledge their support for the global call for action. Thousands of the UAE residents will gather in parks, streets, town squares and homes to witness the lights going out on iconic landmarks and city skylines. The Emirates Wildlife Society (EWS-WWF) has requested people to capture the moments of Earth Hour on videos or still cameras, which will be added to the homepage of earthhour.org. So, upload your videos as soon as you can or send the stills at earthhour@ewswwf.ae. The public can also join Earth Hour interactions on social networking sites like Facebook and Twitter. Razan Khalifa Al Mubarak, Managing Director of Emirates Wildlife Society (EWS-WWF), said, "The actions shown by business and community leaders are crucial to leading a low-carbon resolution to climate change." "The UAE has one of the highest ecological footprints per capita, so our role in addressing what is unequivocally the greatest threat to the planet today is absolutely vital," he added. Al Mubarak pointed out that the participation from the UAE government and private sectors has exceeded the last years, with over 150 organisations signed up for the cause. "The EWS-WWF is expecting the residents to turn off all electricity before going out to the horse race, the music festival or to attend a candle light dinner at a restaurant," he said. According to him, the observation of the Earth Hour is not just about one night. "It's about highlighting the possibilities for change and encouraging long term actions that will reduce the carbon footprints of individuals, groups, companies, governments and nations," he explained. 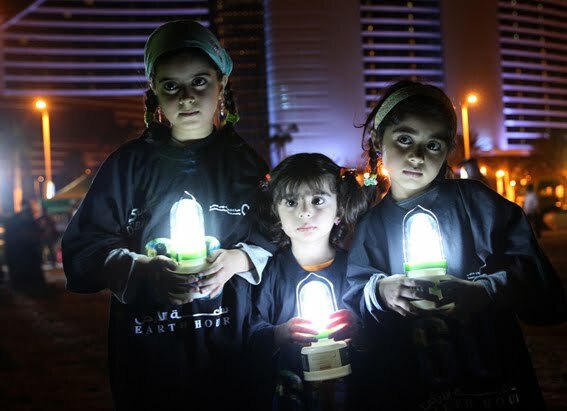 "The Earth Hour should inspire us to reduce our energy use," according to Salem Bin Mesmar, Assistant Director General for Health, Safety and Environment Monitoring Sector at Dubai Municipality. He urged the residents to keep their household appliances in the stand-by mode. "The lights and air-conditioners of buildings and companies and establishments throughout the day consume more electricity than necessary, whereas the consumers can reduce about 40 per cent by partially switching off after the official working hours," pointed Mesmar. "Everyone participating in the campaign can switch off lights in their houses for an hour a day four times a month. This can help reduce electricity consumption by 4 per cent, if you invite 10 people to participate, this might contribute to reducing the rate of 4 per cent of the consumption of 10 houses," he noted. Ida Tillich, an EWS environmental activist, explained the tips that the residents can help support the Earth Hour cause and save energy. "All the residents are urged to switch off lights between 8.30 and 9.30pm today, and replace regular light bulbs with compact fluorescent bulbs." "We also should look for energy-efficient appliances and the energy-saving logo. But the most significant message this Earth Hour observation spreads is the importance of using natural light, instead of artificial light by letting the sunshine in where there are windows," she pointed out. Tillich also highlighted the need to unplug TV and VCR sets before we travel. Such electronics use electricity even when "off". "Wait until you have a full load, before running the dishwasher or washing machine. And clean or change air filters on air-conditioner units in the summer so that they work more efficiently," she advised. Dr Naal Al Hosany, Director of Sustainability at Masdar, the Abu Dhabi Future Energy Company, said: "The Earth Hour is about responsibility, and about the duty that all of us have to protect our environment and to take action against climate change as individuals, families, companies or organisations and as nations." So sign up now and let's make 2010 the biggest Earth Hour yet!